Embroidered fabric is stretched over cardboard and the back finished with black paper. The two magnets on the back compliment the slim-line design. The artist who embroidered the patch is acknowledged on the back of the magnet. 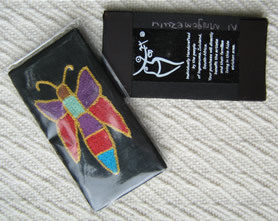 Fridge Magnets are available in small (40mm by 75mm), small with Matchbox and medium (65mm by 105mm). Packaging is a sealed polyprop bag. Price R45.00 for small, R50.00 for small with matchbox and R75.00 for medium. All pricing excludes postage. Wholesale pricing is available on request.